With additional locations in Downtown San Diego, Clairemont, La Mesa, El Cajon & La Jolla. Selling Gold in San Diego? With 6 San Diego Cash for Gold locations, we pay you cash for gold on the spot. Come in and get paid in 5 minutes. At Cortez Gold Buyers San Diego we pay Cash for Gold on the spot. Selling gold in San Diegois easy. If you are looking for Cash for Gold in zip codes 91910 and 91911 you have come to the right place. Get more cash for your gold in San Diego CA ! Highest Cash for Gold payouts in San Diego PERIOD ! You will see that we do provide the highest cash for gold payouts in San Diego CA. How Does the Cash for Gold San Diego Process Work? The process is very simple and usually takes only minutes. 2) We test your gold and jewelry items (usually an acid test is used to determine the percentage of gold in your items (also called karats, for example 14 karat gold stamp on a ring means there is 58% gold in the ring and 42% non-gold materials by weight). 3) We will then offer you a cash for gold quote for the gold you are selling. 4) We get you paid in cash. Please note California State law requires all transactions to be recorded and a valid state or federal photo ID is required by law. You must be 18 or older to complete a transaction. Does anyone else provide CASH FOR GOLD SAN DIEGO? As far as we know everyone else pays you by check. Are you looking for Cash for Gold San Diego? 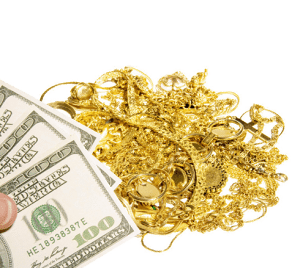 If you are looking for one of the best place to sell gold in San Diego then give us a try. When it comes to paying cash for gold in San Diego we probably have a location near you. Copyright Cash for Gold San Diego. Cash for Gold San Diego is a division of Gold & Diamond Buyers of San Diego.